Greenie Purvis Petyarre is the most successful male artist in an artistic dynasty that includes his aunt Emily Kngwarreye, cousin Gloria Petyarre and a number of blood sisters and half sisters. Now a highly respected tribal elder for Alhalkere country, he was born at Boundary Bore around 1930 where he lives to this day with his wife Kathleen and their four daughters, all of whom paint. Greenie began his art practice in the early 1980's alongside Lindsay Bird, Cowboy Louie Pwerle and several other men prior to the Utopia ‘summer project' organized by the Central Australian Aboriginal Media Association CAAMA. While a number of these men began by painting bold linear patterns representing ceremonial grounds and traveling lines Greenie, from the outset, approached his canvases with far greater intimacy. Over time he revealed himself to be a very spiritual painter with a deep understanding and love for his country. He moves back and forth in his painting between three distinct and easily recognizable styles while rendering his Dreamings, which include Bush Plum, Yam, Emu, Turkey and Kangaroo. In works which most closely resemble those of his countrywoman Kathleen Petyarre, Greenie has created fields of minute dots that imitate the subtle shifts of colour and texture indicating underground water and slight variations in the landform of Alhalkere country. Delicate colour shifts may indicate different stages in the development of the yam seed from germination to maturity, the season and the plant's eventual decline. A second body of works, though rendered with equal unparalleled delicacy, feature regularly scattered roundels with bands of the finest dotting radiating and interconnecting. These more structured, and subtly coloured works can be so very delicate as to belie the fact that they have been created by a man, now in his 70's. His final body is painted in a strong linear style of which this particular work is a fine example. These paintings tend to be far more highly colour charged and are said to depict the root system of the bush tucker plant and the colours of the wildflowers that spring forth after rain. In these linear works, Greenie employs only one layer of paint, rarely reworking his line with a resultant variation in the texture of the finished artwork. This particular example is one of his largest and most impressive in this style. Painted in October 2006 it measures 187cm x 204cm. The viewer is at first attracted by the work's size, and its mesmeric bands of colour. Its format creates a vortex. When you are ready, the depth of it creates its own internal space and draws you in without being overwhelmed. Regardless of style, Greenie's paintings reflect his unpretentious personality - quietly unassuming but with that feeling of endurance and respect. Over the years he has painted for a variety of dealers including Delmore, Mbantua Gallery and in more recent days Lauraine Diggins Fine Art who has introduced his works to audiences in the U.K., Russia and France. He was represented in the first ever National Aboriginal Art Award in 1984 and was a finalist in the Telstra as recently as 2004. His paintings have also been included in numerous important group exhibitions and two solo exhibitions at Gabrielle Pizzi Gallery in Melbourne in 2000, and the Hogarth Galleries in Sydney in 2003. Important collections that hold his work include the Art Gallery of South Australia, Artbank, The Aboriginal Art Museum in Utrecht, The Museum de Lyon, France, and the Thomas Vroom Collection in Amsterdam. 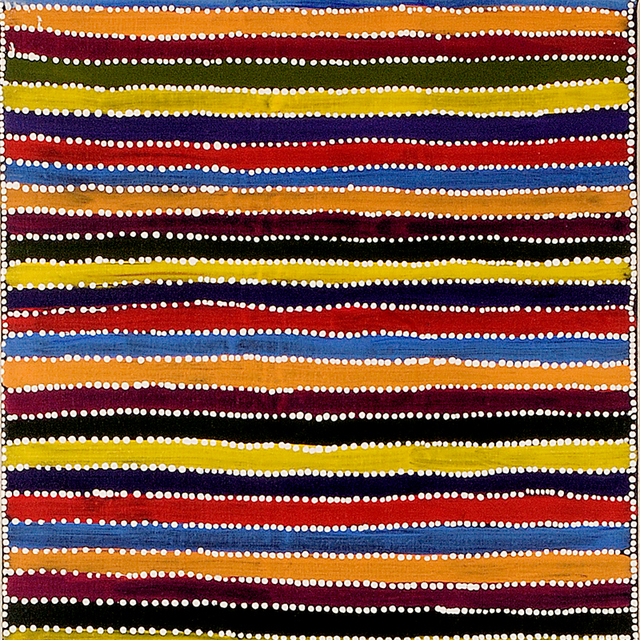 While his clearance rate at auction is poor, his highest price is still the respectable $17,625 paid at Bonham's and Goodman in November 2004 for a Mbantua Gallery provenanced work that carried a presale estimate of $15,000-25,000 (Lot 13). It was a slightly disappointing result for a work created in 1999, which measured a whopping 120 x 270 cm. Nevertheless collectors should not be put off by this. Despite his age Greenie continues to paint at Boundary Bore and at Camel Camp creating works of which a very high proportion are rendered with the greatest integrity and intimate detail. The best of these are a pleasure to behold, and a privilege to possess.